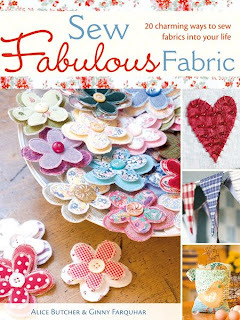 Today is the 18th of September ... publication date of our first craft book Sew Fabulous Fabric. It is a really exciting day for us! As we are new authors and not famous there are no trumpets fanfaring and no book launch parties...aah! ... maybe one day though?! We do, however have a book event planned next month on Saturday 18th October at our local Waterstones in Farnham. If you are nearby please do pop in and say hello. So what shall we do to mark today? What about a virtual launch? Not sure how to do one really but my guess is a bit of bubbly and lots of cake with some good company. Anyone care to join Alice and I?...we raise our glasses to toast the arrival of Sew Fabulous Fabric... hic! 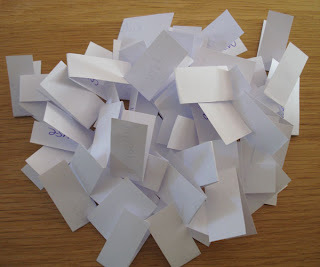 And now for the bit, as they say, you have all been waiting for...the winners of the draw for a free book. Firstly we want to say a huge thank you to everyone who entered. We were overwhelmed with how many comments there were and offers to review it on your blogs and we thank you so much for all your lovely messages and good wishes. It has been great to make some new friends and to have some new blogs to read too. 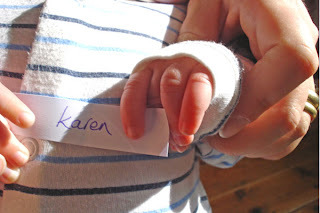 Alice and I did the draw this morning, picking out 3 names as we have 3 books to givaway. a lady with a long nose (do i win Pip? 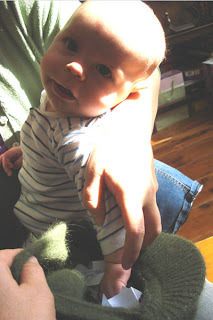 ), a green hat and a baby. 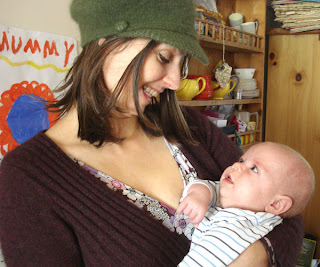 The names were then put into the green hat by the lady with the long nose and then the baby... the very cute Rufus picked them out, helped a little by Alice. 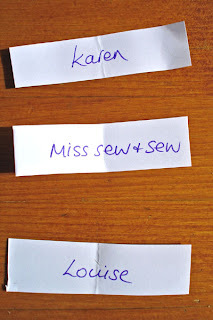 The next name drawn was Louise from this is my patch and home is where the heart is and the final name to be pulled out of the hat was miss sew and sew. Well done to all of you and if you could please email me your postal addresses i will send the books out to you. For anyone who is still interested in buying a book it is now 'available' and can be purchased online via Amazon and other similar sites both in the UK and USA. It is also listed on some Australian sites too. It will also be available in local book stores and if it is not in yours just ask and they should be able to order it in for you. It is also available from our publishers David and Charles. So back to the bubbly.... cheers everyone... this has been fun! ...and fingers crossed for us for good reviews! Congratulations to the three winners! But the biggest congratulations of all to you two...Ginny and Alice, authors. Go girls! Hope you're still sipping that bubbly! Many congrats Ginny, how exciting. Um, I'll be in Farnham...about 2 months too late!!! I so wish I lived closer so I could pop along to Farnham and say hello! See you in November though.. I will just have to be patient.. not one of my virtues! Thanks so much for your birthday wishes Ginny..
Congratulations to your winners! I'm definitely putting that book on my Amazon wish list. *Clink* .... here's to you two and lots of future successes. MMmm, yumm.....hic! Thankyou for the bubbly! 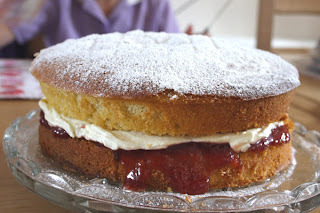 Oh and the.... sorry a bit of crumb..... the cake! Well done to the winners, can't wait for their reviews. Well done again to you too! Happy signing!! Congrats to all the winners, I am definitely buying a book - it looks scrumptious.I am so happy for you i can't even imagine how excited you must be. hugs. This must be such an exciting time. I might be able to make it to Farnham next month, it really depends on who needs a lift where etc you know what family life is like! but if I can escape, I will pop over, it would be great to meet you. Many congratulations to you both, I'll be looking out for this in Waterstones. Congratulations on the book. I can eat that cake and not be concerned about calories. congratulations! thanks for the bubbly! Just got home from my holiday's to discover that I'm one very lucky lady indeed. I can't wait to have a look. Thank you sooo much. I can't seem to find and email address for you so I can send you my details. Please can you email me so I can reply with my address. Hello! Congratulations on your new book (albeit late). Do you live in Farnham? I was christend in the church there, and my grandma lived in Crondall lane (?) ... i havent been there since childhood though. Good luck with the book sales. So nice! I love it! Very artistic. Nice blog.